Hi I'm rotary swing tour instructor Craig Morrow and today I'm gonna talk to you about a few of the common pitfalls I see when people are working on their drills to the five minutes to the perfect backswing. If we're gonna get into the correct position at the top of our backswing, we have to make sure that we're doing the drills correctly and it's something that I see on a day in and day out basis that our members or students are putting in the time and their putting in the effort but their getting into an improper position because they miss one or two things in the drills and they've spent tons of times ingraining the improper position. And we wanna make sure that you do the drill correctly so that you're getting into the correct position at the top. And so, what I wanna do today is I wanna show you a few of the common pitfalls that I see on a daily basis and to making sure you're ingraining a nice position at the top versus missing one or two key elements that's keeping you from getting into the correct position at the top. So, the first thing is, is that when people add their right elbow flection they lose their shoulder elevation. So, let me show you a little bit about what that looks like. They elevate to the base of their pec, but when they add their right elbow flection, they lose their shoulder elevation. Now you can see that my right elbow's more in line with the middle of my torso and that my left arm's coming more across my chest. This isn't a very powerful position. If I bend over and rotate, now my arms are deep. Now my hands are low. I'm not gonna wanna create any lag and I'm typically gonna drive hard with my right shoulder to try to get any speed or to get that club head working back out in front of me. And for those of you who've watched any videos on the site we know that right shoulder on the down swing is our enemy. We don't wanna use him too much. So, let's make sure that when we add our elevation and fold our right arm that we don't lose that elevation. We want this left forearm blocking out our right eye. We don't want it below our head. We definitely don't want it up here. But we want this left forearm blocking out our right eye. Just as what we talked about in the checkpoints video. If we don't lose our elevation, this left forearm should be blocking out our right eye. The next thing that I see, is that people get the arm motion correct, they get the elevation, they get the flection, they get the left forearm rotation as the right arm starts to fold. All the good things in front of them, but then they lack the rotation going back. They move their move their arms independently from their body versus aligning their body to transport their arms and club a completed position. They get everything correct with the arm motion and then they go like this and they think that they've rotated to the top. Well you haven't rotated. All you've done is just moved your arms. You can see that I've lost my connection between my upper right bicep and upper pec and now my arms and hands have gone very far across center line. So, if I were to bend over, you can see that my arms are now behind me versus being in front of my sternum or being in front of my chest. The left arm's gonna cross center line a little bit as we continue to the top and as the right arm folds. We don't wanna manually get if to cross center line too much. This isn't very supported and it's not very powerful. So, what we've gotta do is we've gotta make sure that we maintain this connection between our upper right bicep and upper pec. And that we rotate back, using the right shoulder blade, using the right oblique. Not going like this. Keeping that connection and we're rotating back. The last thing that I see, is that people get either too little wrist set or too much wrist set. Now, wrist set throughout the golf swing is gonna be very gradual. It's gonna feel something like flipping a coin over your right shoulder. If I was in this position and just flipping a coin over my right shoulder nice and gradually, I add a little bit of set, and a little bit of hinge. That's all the amount of wrist set that we need in the golf swing. It's a nice simple motion. There's no max set. There's no too little set. So let me show you what the two differences look like. If you add elevation. Add a little bit of flection, if you get into this position, then your wrists are too tight and you're grip is too tight. You haven't allowed for any wrist set. The club's pointing up towards the sky. We wanna make sure that we have a little bit of wrist set. So, don't hold the wrist too tight. Don't hold the grip too tight. If you have too much wrist set, now the club's gonna be pointing down towards the ground. That means that my grip is too light and my wrists are too supple. I'm not controlling the club anymore. Now I don't know about you guys, but I still wanna be the boss of my club. I don't want him telling me what to do. And if you get into that position, he's gonna dictate what you do. So, we've gotta make sure that we keep a nice grip pressure and that we're kind of actively controlling it, but not controlling it. We allow for a little bit of wrist set and we maintain control of the golf club. We don't give up on it, allow too much wrist set. We don't hold off on it. Not allow any wrist set. Use this as your checkpoint. If you get into this position, where you have this box, then you have about the proper amount of wrist set. If you form an L, then you know that you're not allowing your wrist to set and that you're holding it too tightly. If you form this kind of right triangle looking thing, where the club is pointed down towards the ground, then you know that you're not controlling the golf club enough and that you're allowing for too much wrist set. So, make sure, that as you go through the drill, that you just form this little box. It's not gonna be perfect, but just form this little box and that'll mean that you're allowing for the wrist set to happen and it's in a good location. So, check those pitfalls. Make sure that when you're folding the right arm, that you don't lose your shoulder elevation. That when you get the arm motion correct, that you use rotation to transport the arms. You just don't move your arms independently of your body. And that you have the proper amount of wrist set at the top. It's gonna be very gradual. Just a little bit of hinge, a little bit of set. We're not gonna give up control. Get too much. We're not gonna not allow the club do anything by controlling it too much and getting this wrist too tight and not allowing it to set. So, take a look at those. Let's make sure we do the drill correctly and let's get into the correct position at the top of the backswing. 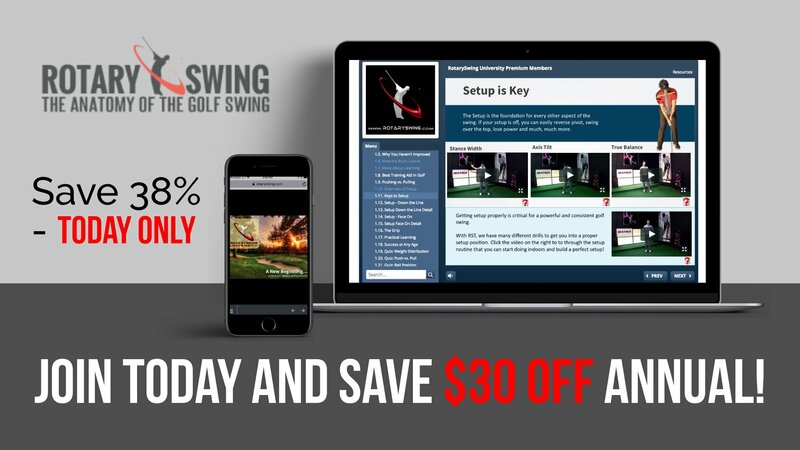 Get Your Free Membership to Finish Watching "5 Minutes to a Perfect Backswing Pitfalls" Right Now!